Within the framework of his official visit to the United Arab Emirates, President of the Republic of Uzbekistan Shavkat Mirziyoyev on March 26 held talks in Dubai with the UAE Vice President, Prime Minister, Ruler of the Emirate of Dubai Sheikh Mohammed bin Rashid Al Maktoum. The latest achievements in the scientific and technological progress of humankind in diverse fields are embodied in this largest city of the Emirates. For example, often called the eighth wonder of the world, the artificial Palm Islands are the biggest man-made archipelago in the world, impressing with their scale and dazzling beauty. Dubai boasts the highest and most luxurious hotels. And the world’s tallest skyscraper, Burj Khalifa, beat the Guinness Book of Records on as many as 11 indicators. The planet’s longest automated metro system and an indoor pedestrian crossing are in this fabulous city. The desert climate notwithstanding, the metropolis entertains the largest magnificent flower park in the world. Local beaches are regarded as the cleanest on Earth; this city receives an average of nearly 16 million visitors a year. Dubai has beaten scores of records in other areas, as well. All these accomplishments became possible owing to the policy of openness and rational use of natural resources. And one of the key inspirers of Dubai’s social and economic boom has been Sheikh Mohammed bin Rashid Al Maktoum. Uzbekistan has been opening up to the world. It pursues a policy of accelerated dynamic development, and world experience is vital in this, as is vigorous interaction with foreign partners in the innovation, trade, economic, investment and other fields. The enhancement of multi-dimensional bilateral cooperation was the focal point of today’s meeting of the President of Uzbekistan Shavkat Mirziyoyev with Sheikh Mohammed bin Rashid Al Maktoum, which took place in the Zaabeel Palace. The Vice President and Prime Minister of the United Arab Emirates, warmly welcoming the head of our state, stressed his satisfaction with the agreements reached yesterday in Abu Dhabi between the two nations. 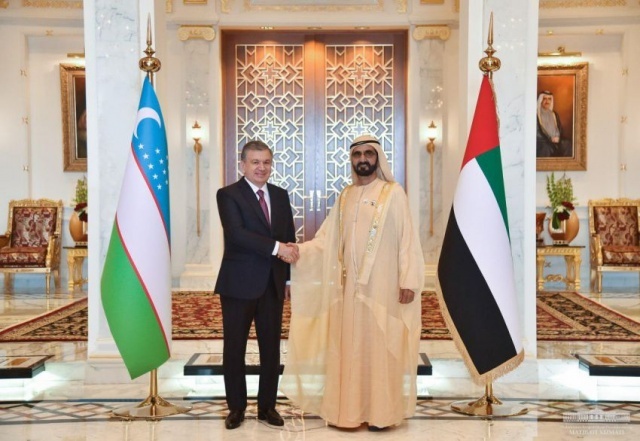 The Ruler of the Emirate of Dubai underscored interest in consolidating the manifold ties with Uzbekistan that has entered a new stage of its development. In his turn, Shavkat Mirziyoyev expressed sincere gratitude for the warm welcome and support for promising joint projects, and said that Uzbekistan is willing to build up relations of friendship with the United Arab Emirates and Dubai in particular. In the course of a trust-based conversation, the parties discussed means to further expand practical cooperation and swap experience in a number of areas, establish new contacts at various levels. The talks gave way to a ceremony of exchange of signed documents. The latter included agreements to set up a joint investment company, prompt infrastructure modernization in the city of Samarkand, establish a state-of-the-art agricultural cluster, along with bilateral pacts on cooperation in agriculture and logistics.